You roll out of your sheet hibernation while she still rests, lightly stepping over a couple books and that empty coffee cup from two days ago. You creak down the stairs, shove your boots on and sludge through the snow to get across the street. 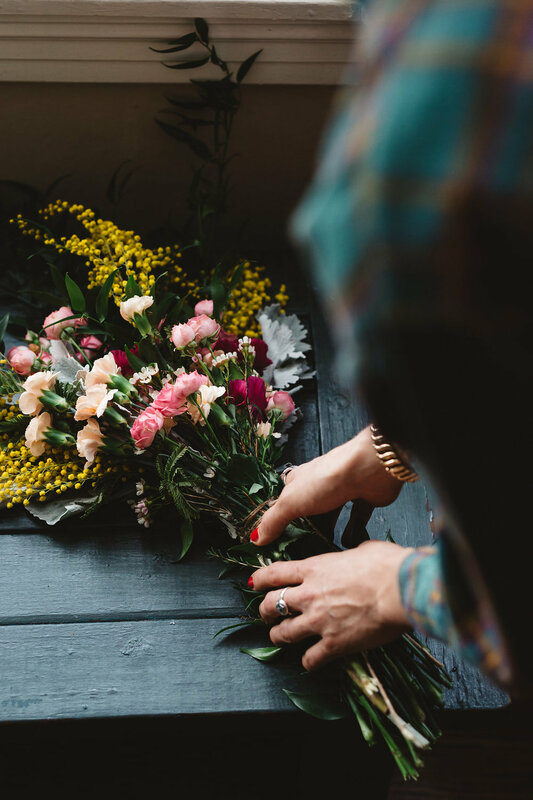 The corner florist has the bunch you picked out in the fridge, waiting, on standby. "You're welcome! Good luck!" she says with a wave while you rush out the door and into the morning street. You quietly nudge open the front door, knock your boots off, flick the faint light on in the kitchen for some coffee. You go to sip and take a minute in the living room to write before she wakes. 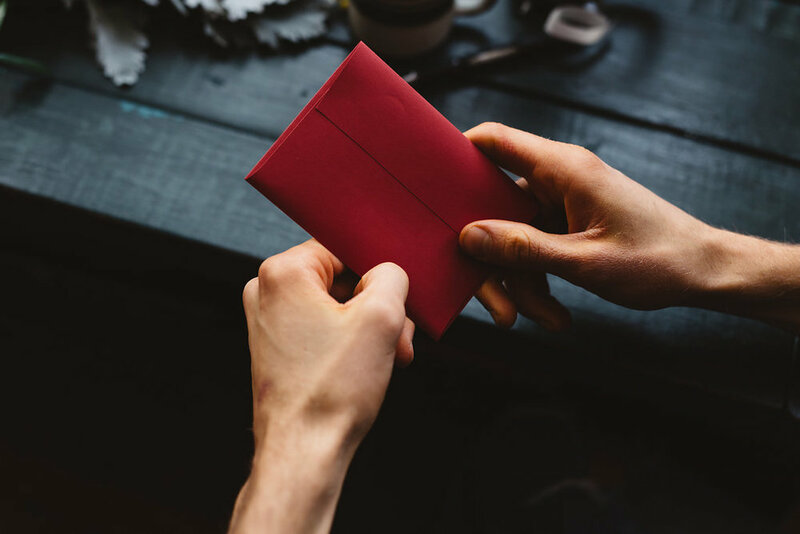 With your note enveloped in red, you ram your feet back into your boots, toss your coat on and tuck your note into her jacket by the door before slipping out the door for the day ahead. She stirs and yawns and wakes after hearing the door thud closed and briefly peeks at her lit phone. "Coffee's hot in the kitchen, ya sleep talking bum. I love you." She checks the time before clumsily knocking over a couple books and that empty coffee cup from two days ago. Her drowsy feet navigate the cool, kitchen tiles. "Coffee, thank goodness." she whispers. She rubs her eyes and slumbers with a full cup over to her spot, the front nook. The flowers have been holding their breath, waiting for her. Their delicate blooms smile when she walks in. She takes the last sip of her quiet morning as their dog stirs and barks at her feet. She gives in, turns the shower on, gets the toothbrush out, slides into her jeans. Her boots are ready and waiting for the snowy, polar morning. 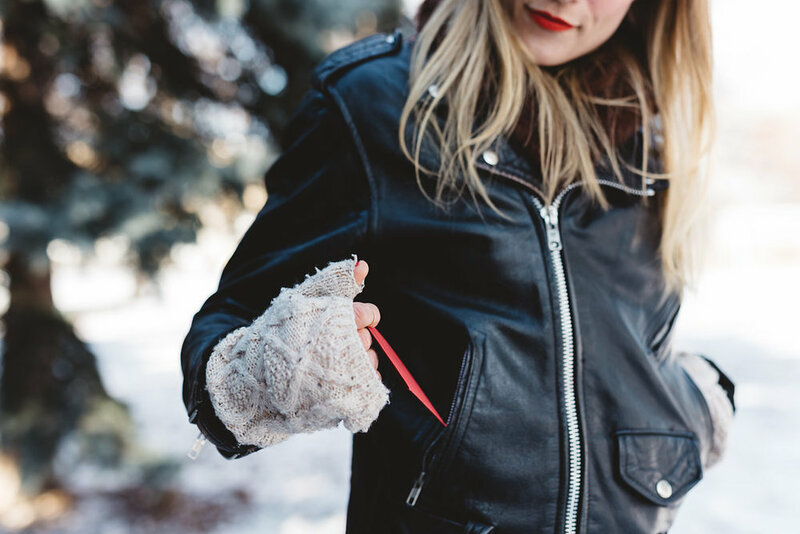 Unzipping her pocket to warm her fingers, the crimson envelope you've planted an hour before slides against her hand. She pulls it out, her pigmented lips breaking into a smile. She mouths the words you've written as she reads them and laughs before tucking it back into her coat. It doesn't have to take a lot, instead quite simple things, really, to keep a heart burning. To interrupt Saturdays and coffees and walks so the one you love feels how we all want to feel. Shoot styled by the graceful and gorgeous Lexi Haslam with photography by another damn good, talented human being, Laura Rowe. The male in these shots requested to be anonymous, but his name starts with a J and he is sensational and tall.